Luxury homes aren’t complete without elegant lighting backed by sophisticated technology to manage it. Smart technology means you can turn on multiple interior lights while you are still in the driveway making it a very smart home indeed. The Clipsal-produced C-Bus Control System allows homeowners to control multiple devices in the home using a third party system like their mobile phone. Everything from the home’s lighting, security, air conditioning and heating can be turned on or off using the system from within the house or kilometres away. When it comes to lighting, we are creatures of habit. We often use the same lights when we entertain, so it makes sense to have a Party button on your control system. Not only will it activate indoor and outdoor lights but can also turn on the music. Your entertainment lighting is quite different to your movie watching lights. 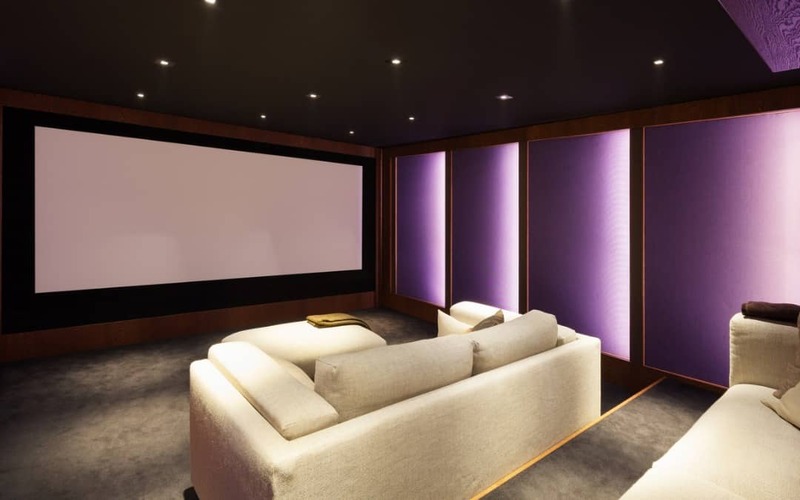 Chances are you only need limited lighting in your theatre room so use another button to turn on the lights, close the curtains and start the movie. A popular feature of the system allows you to turn on the lights and devices you need upon entering the home. The Welcome button can be programmed to turn on the porch light, entry and living room lights, so there is no need to put down your bags to flick on light switches. You may like the air conditioner and TV to turn on at the same time; they can be programmed too. But if you don’t want to instruct the system every time you arrive home after dark, you can use the opening of the garage door as the signal to turn on the welcome lights and appliances. When it’s time for bed at night, the last thing you want to do is move from room to room turning off or checking lights and arming the alarm. The Goodnight button can do it all with the press of one button. If you are concerned about leaving your home unoccupied while you are away on holidays, use lighting to make it look like you are still living there. Your system can be automated so a set number of lights turn on and off each night. Motorised curtains can be programmed to open each morning and close at night ready for the lights to switch on. Fool any potential burglars into thinking you never left. Most security systems come with a Panic setting which is often the home’s alarm. Many homeowners don’t want to wake their children and the rest of the neighbourhood after hearing a noise outside so they won’t use the setting. With a C-Bus Control System, the Panic button can be used to turn on indoor and outdoor lights for peace of mind. A home’s standard light switches are redundant with a control system. C-Bus wall switches are the high tech version of a light switch. If you have the old style faceplates with four switches to control lights in locations, you can’t remember you’ll enjoy the electronic labels. The names against each button tell you at a glance what each switch is used for. Alternatively, use the remote control, so there’s no need to even get up out of your seat. Now that’s smart thinking.